As much as rice with little adornment is very much enjoyable as a side, I do like to dress it up sometimes. 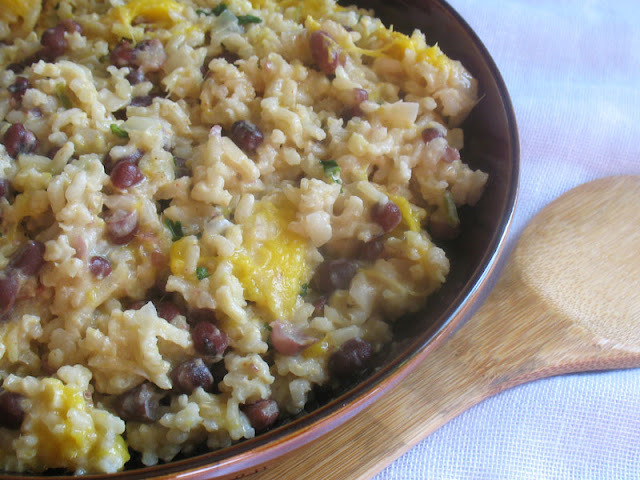 In this case, rice made for a perfectly balanced meal, cooked with some creamy coconut milk and complete with the addition of adzuki beans, fresh citrusy mango and zesty lime. There is bit of heat from the chilies, but it's not a spicy dish — the seasoning and additions are meant to complement the main flavors present. Each bite is to be savored and you won't need anything else to go along with the dish to feel satisfied and content, unless you fancy a side green salad. One-pot meals are often the way to go when there is little time or inclination to cook, and especially suited to hot summer days too when hovering over a hot stove is generally not preferred. This recipe has been adapted from Thug Kitchen: The Official Cookbook . I surely don't need anymore cookbooks. I've enough to generously stock a section in a decent sized used bookstore. And that collection doesn't even take into account the printouts, magazine clippings and bookmarked recipes that crowd my space. All the same, it is an addiction of sorts, and from time to time I'm still tempted to purchase a few new releases at least a few times a year. So, Thug Kitchen is now part of the collection. I've been following the blog for quite some time now and asides from being impressed by the refreshing vegan options, the presentation is highly amusing to my sense of humor. If you enjoy serious food served up with a healthy dose of cuss words, this is the book for you. Humor aside, this is a considered cookbook providing advice about staples, recipes and guidance for those wishing to switch to a healthier diet that certainly is not lacking in taste nor creativity. As a well-seasoned cook and vegetarian, I am impressed with the array of recipes that will appeal to novices and experienced cooks alike. For a twist, consider using kidney beans in place of the adzuki beans, although I do enjoy these small red beans that originated from East Asian. Commonly used in sweet treats after they are turned into a sugary red bean paste, they are equally delicious in their own right and really don't take long to cook, much like mung beans, though nuttier in flavor. They can be soaked overnight, but usually a few hours is enough, unless your beans have been languishing in the pantry for too long. I prefer to soak them for at least 4 hours. Rinse the beans and soak for 4 to 6 hours or overnight in several inches of water. Drain and rinse, then transfer to a small saucepan and cover with fresh water. 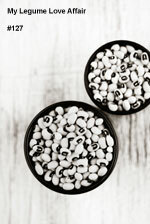 Bring to a boil, reduce heat to low, cover, and simmer until the beans are tender, about 40 to 50 minutes. Drain and set aside. Heat the oil in a large saucepan over medium heat. When hot, add the shallots and sauté for a few minutes to soften. Add the ginger and chilies and stir for another few minutes. Add the rice to the pan and stir for a few minutes, until slightly toasted. Pour in the coconut milk, stock or water, cayenne and sea salt. Stir, bring to a simmer, and reduce the heat to low. Cover and cook for about 40 minutes, undisturbed, until the liquid is absorbed and the rice is thick and creamy. 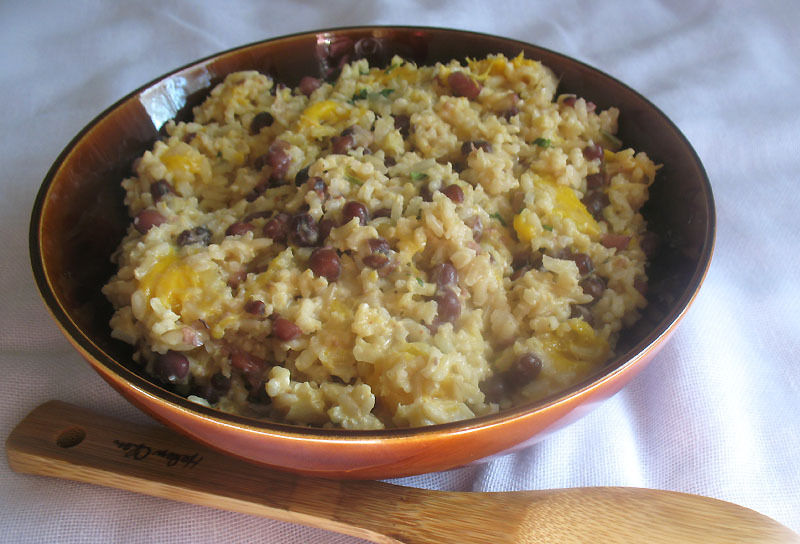 Fold in the cooked beans, lime juice and mango pieces. Turn off the heat and let sit on the element for another 5 minutes. 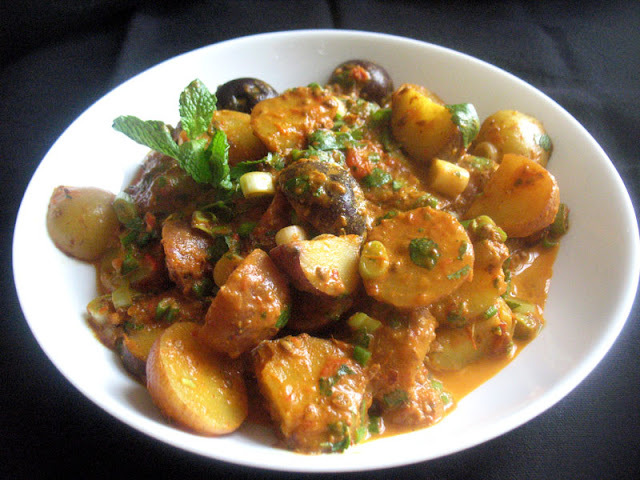 Toss with a fork and serve hot or chilled garnished with fresh cilantro if desired. 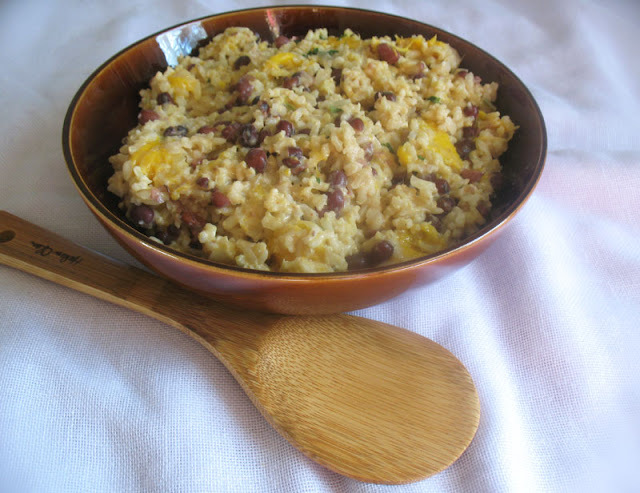 I'm sharing this with Jacqueline's monthly Bookmarked Recipes event. I love finding new ways to dress up rice! This sounds delicious!